The view at the little jogging track is no more. 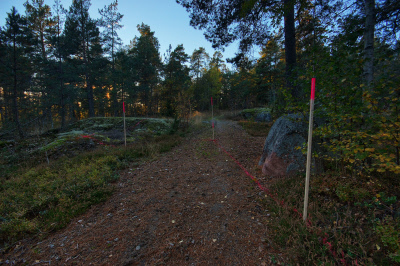 Where the magic light once was the forest floor has been laid bare, for the foundations of the new street, Heklagatan, to be laid. When I re-discovered the little jogging track back in June, I thought I only had days before the view would be destroyed for good. As it were, not only did I have enough time to complete my eight-year quest, but enough time to see the little jogging track throughout the summer, during autumn and finally during winter when the trees were covered in snow. As I got the photo I waited eight years for, I relaxed. The end of the little jogging track didn't seem so imminent any more. But I knew that time was running out. I started biking to the little jogging track as an exercise, bringing my photo gear with me. It was a good 24 kilometer trip there and back, so even if I didn't do any jogging, the little track sure imparted physical health! The Little Jogging Track at Night panorama was shot during a particularly long one of these trips, when I proceeded past the little track and out onto the northern parts of Järvafältet. The weather was often pleasant and with some timing, I got some really nice pictures during the golden hour. But I knew that time was running out. First came wooden sticks with their tips painted bright pink as September turned to October. Any hope I had of the view surviving the development of the area disappeared. The area they marked out clearly included just about every important landmark in the view. I started moving the sticks out of the way to get my shots, carefully putting them back afterwards. Sometimes, when they were far away, I just photoshopped them out afterwards. Shortly after the sticks came bright pink demarcation lines that were sprayed on the ground. I removed them by overlaying a layer with blend mode set to "Color" and some curves adjustment, or simply left them in. Unfortunately, Sweden had a very cloudy summer with little sunshine - and the autumn followed in its tracks. Without sunshine, there would be no nice golden sunset. I started reading the weather forecasts again, marking every day with potential for sunshine as one that I would go out to the little track. But I knew that time was running out. 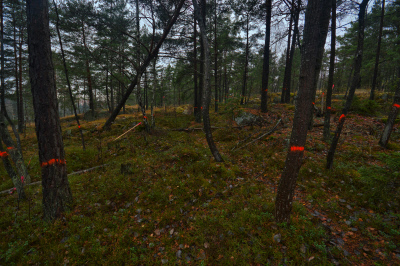 Then, in November, came the bright orange marks that marked which trees were to be cut, and I knew that if I were to do anything, I'd better get it done quickly. But the weather just wouldn't cooperate. The first snow came on November 29th, but I was still no closer to good light. Finally, December 2nd and 3rd offered a pair of good days. The 2nd would be clear in the evening and night, and the 3rd promised to be clear in the morning. I don't trust weather forecasts, and when it comes to cloud cover they're especially dodgy, as a single little cloud can spoil the golden hour for just the spot you want to photograph. 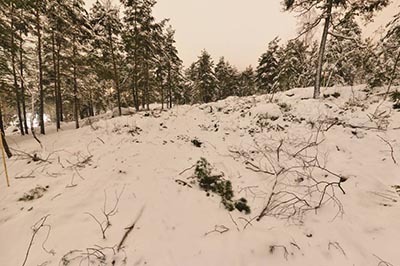 I went out both days and shot the winter panoramas I didn't think I'd get back in June. The weather kept being a long series of overcast, overcast, and overcast. Finally, after another heavy snowfall, I decided to go out at night and see if there was anything worth photographing. I climbed up the slope on the side of the road - a lot easier now that snow had packed the spaces between the stones - and came to the start of the little jogging track. Correction, I came to what was left of the little jogging track. A swath had been cut through the forest. It was done. The forest had finally been cleared for the new street, called Heklagatan. Using a GPS and looking at the leftover tree stumps I found the spot I had used to photograph the view from. Here is the view, as I first finally managed to photograph it in summer, as I photographed it in winter, and what it is like now. Ultimately it isn't possible to preserve very much in a photograph. The times when I've tried to really "capture the moment", it has only worked because the photo could be made to trigger my own memories - never because the photo itself carried the memories. There's just so much that is lost when you turn an experience into a two dimensional array of pixels. As art, it falls incredibly short. (...) As documentation, well, we'll see in a couple of years' time if I regret missing anything. When the new residential area is built, I'll be able to complete the summer, winter and swath photos with a shot from the same place, but now with the new houses and roads. And, you know what? Looking at the map of the area, it looks like there will still be parts of the little jogging track around.